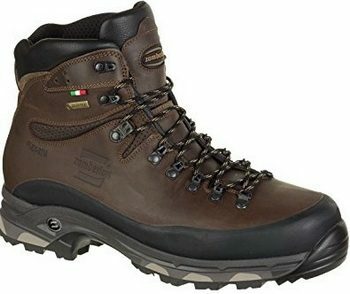 Do you have a hard time finding good hiking boots because of wide feet? It’s practically impossible to prepare for winter wear without considering the best footwear that can help you survive the most extreme climates and inclement temperatures. The sad part is that the majority of outdoor boots are manufactured based on the average width of feet. As such, people with wide feet end up forcing their feet into narrow shoes. This action will leave your feet constricted with blisters and possible injuries. That being noted, you have to devote time searching for the best hiking boots for wide feet on the market. We’ve just done that on your behalf. Keep reading to find your best pair for either women or men. 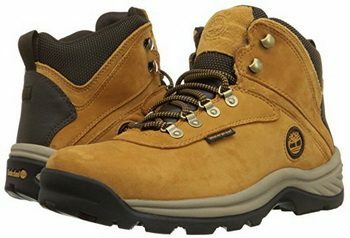 We have found several hiking boots for those with wider feet. Be comfortable as you hike! Read on to be enlightened. 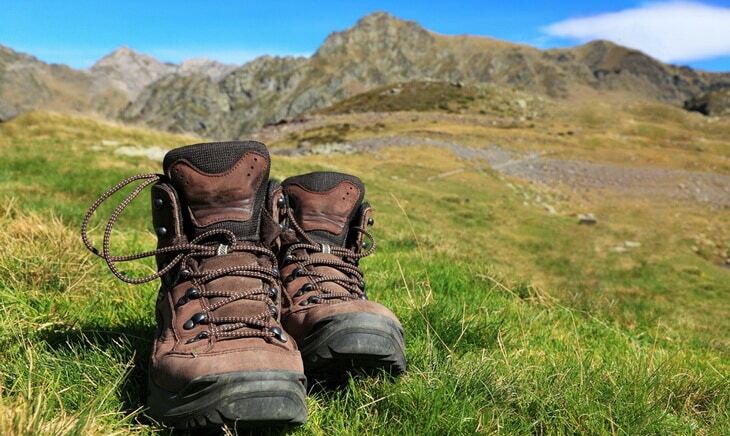 Hiking boots for wide feet do not differ a lot from the average boots with regard to features except the size. So most of the features are common. Anyway, we will focus on equipping you with tips on what to look for when faced with hundreds of shoes to choose from. Our evaluation goes into the comfort, weight, warm, waterproof/resistance, breathability, durability, and other features that might be significant to the performance of these shoes. When looking for boots to fit wide feet, it is inescapable that you are going to find heavy boots. But you need not give up on refining the weight of the boots. The ones we’ve reviewed have weight figures indicated. If your feet struggle to survive heavyweight footwear, you must then pay more attention on the weight. Most of the weight is exerted by the huge outsoles and heels that these boots have. But note that you can still find the best hiking footwear that is lightweight with a better traction without having a thick outsole. The comfort is determined by how protective the footwear is and how soothing it is to fit your feet in it. These should be the primary features of every footwear for wide feet. The boots should not cause soreness or blisters on your feet. You should be able to walk or run freely in such feet because of the features such as an enhanced cushioning on the foot bed, gusseted tongue and padding of the boots. Moreover, the boots should be insulated to keep you warm and dry in any climatic condition. Some boots are designed with Gore-Tex membrane, for example, to enhance the comfort of wearing them. Gore-Tex membrane is an insulating material with a plethora of benefits that include waterproof to keep water drops away from your feet. Hiking boots are generally designed with waterproof fabrics. But then there are various types of waterproof materials, and they differ in quality. Some insulating and waterproof materials such as the Gore-Tex, eVent and the Hyvent are commonly embedded in many outdoor hiking boots. You have to take that into account as well that which material is more superior. Other hiking boots are coated with polyurethane as a water resistant layer so that water can just bead off and roll on your shoes. Be alert that a water resistant coating, unlike the waterproof membrane, can deteriorate long before the footwear deteriorates. A proper care is needed to extend the durability of such coating. For example, if you notice that your hiking boots start to absorb water instead of repelling them, you need to re-coat the footwear. The other hiking boots come with seam-sealed constructions. You also need to re-coat them to restore their superb functionality. There’s nothing more upsetting than a tiny toe box that disables my toes to move around freely. That being said, special attention is needed on the toe box to see if your toes can fit properly without inconveniencing your trekking. A proper fit is also enabled by the type of shoelaces. Some hiking boots do not have these, whereas others do have them. It’s a matter of what do you prefer. Also the shaft of the hiking boot should at least 4 inches high for a proper fit. Durability is enforced by the type of the materials used. 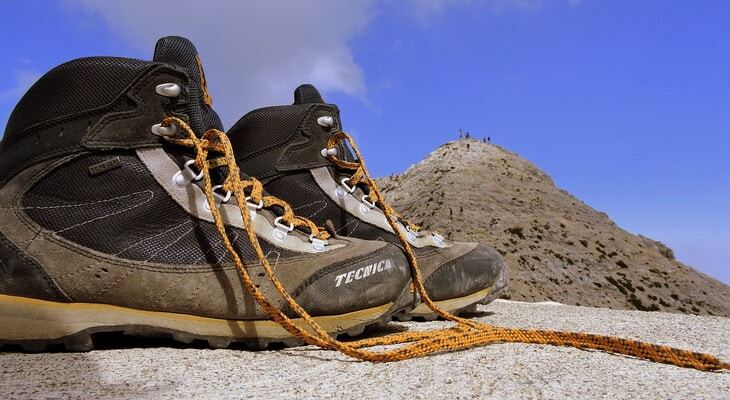 Because of the nature of the construction of hiking boots, durability is not that of a major concern. But to stay on the safe side, be on the lookout for the footwear with sturdy materials. The rigidity of the outsole is also a major factor of durability. It has to be rugged enough to survive all kinds of surfaces. Furthermore, it has to provide a better traction. 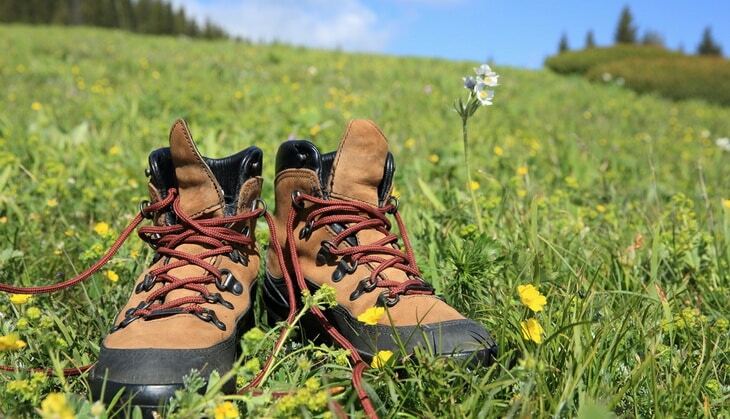 The hiking boots are usually made of leather or rubber. Rubber materials are renowned for their excellence in waterproof, durability and comfort, whereas the leather materials are known for their durability and sturdy design. Walking in warm hiking boots subjects our feet to too much of perspiration. The end result of that will be smelly feet if worn after a long time. This feature needs to be accounted for. Other hiking boots have mesh vents to help with adequate ventilation. These vents could be on the side or the upper side of the hiking boots for women and men. It is therefore important to look for hiking boots with breathability, unless you do not plan to wear for a long period of time. With these features in mind, you will be able to choose the best pair for yourself. 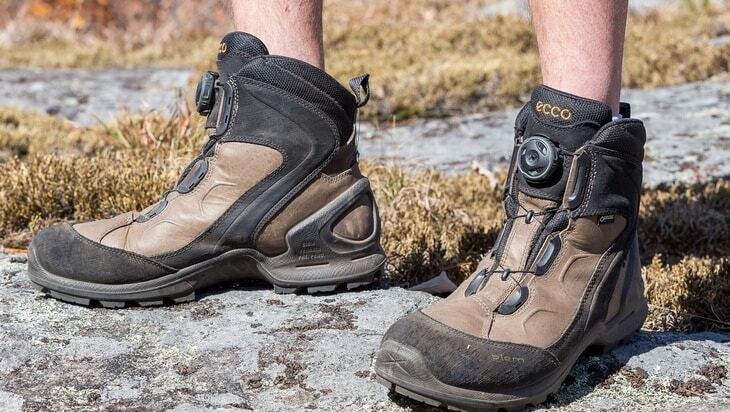 Let’s now delve into the reviews of these hiking boots for wide feet. These boots have not been classified into women and men. We believe they can be suitable for any gender. 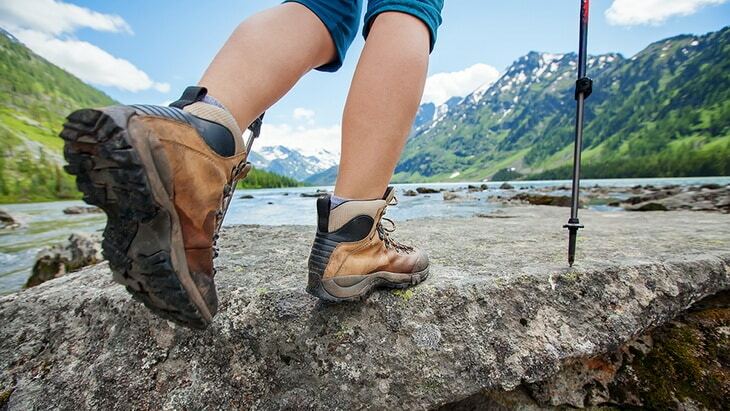 Now, we are going to show you the top products when it comes to hiking boots for wider feet. We sure hope that you find what you are looking for here! Be sure to check out the specifications for each boot, so you can find the one that will fit your needs in the best way. Specific features: Synthetic sole, shaft is 4 inches high from the arch, made of leather and textile, M-select fresh odor prevention and dry moisture-wicking, shock-absorbing air cushion heel, mesh vents. 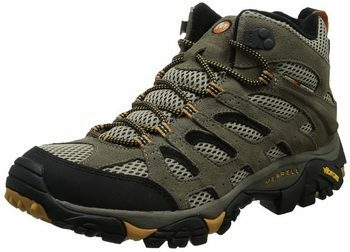 Description: The Merrell Vibram Hiking Boot will fit any wide feet well. It is the best companion for bikers and hikers. The footwear is made breathable by its mesh lining which helps reduce sweat and provide comfort to the feet. More comfort is brought by the Aegis Antimicrobial solution which prevents the formation of odor-causing microorganisms, and also the Ortholite Anatomical foot bed for extra cushioning. 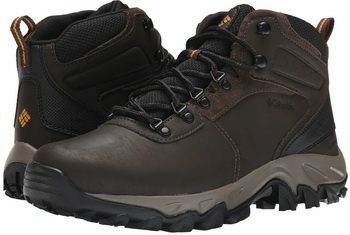 The other intriguing feature is the compression molded EVA foot frame, which adds to the comfort of these hiking boots. Meanwhile the heel adds stability and absorbs shock. Furthermore, the lug patterns on these hiking boots provide stability regardless of which conditions you are exposed to. They help you have a better traction even on slippery and downward slopes. The company has provided its patent technology of M Select Fresh to help prevent any formation of odor in your shoes. The technology lets the antimicrobial agents to penetrate and then destroy the reproduction of any microbes. Related: When hiking, you should have a good pair of socks. The Innotree SS01M Hiking Socks are under $20 and made of cotton, nylon and Lycra. They are thick, wick away moisture and won’t smell. Description: Timberland has launched its first weatherproof footwear in 1973. That is long enough to be convinced that the company is indeed excelling in the provision of rugged and weatherproof hiking boots that are comfortable and durable. With the Timberland White Ledge Waterproof Boot, you will able to enjoy your weekend adventures with great comfort and protection against the outdoor elements. The boots are designed with a waterproof leather that is seam-sealed to prevent any penetration of water drops into the boots. Meanwhile the perforated foot bed is breathable and the rubber lugs help with a better traction whereby you can break at anywhere or jump onto any terrain without a fear of slipping away. For more traction, the company provides the B.S.F.P system which is designed for an excellent traction. The ankles are made comfortable with the padded collar and gusseted tongue. Users like the choice of three colors and the quality of the boot. The padding is comfortable and the waterproof feature works well. Related: To keep the leather in good standing, the Fiebing’s MOIL00P006Z Mink Oil Paste can be applied to the boots and keep your leather smooth. It also helps to preserve the waterproof feature, and it is made in the USA. Description: The Thorogood Oblique QXL77Y Boots are built with a high quality of craftsmanship to help you withstand any climatic condition. The full grain leather is made waterproof so that no water leaks through the fabric. On the other hand, the removable dual-density polyurethane foot bed provides more breathability because of its air vents. The mid sole is also coated with polyurethane. These hiking boots are slip-resistant, meaning that you can confidently trek on any slippery surfaces after it had rained. 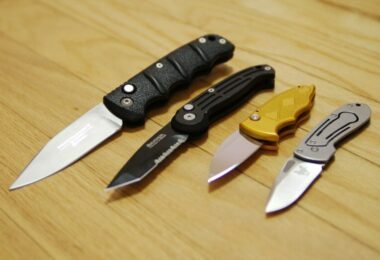 The fiberglass shank helps to support and to stabilize the footwear. 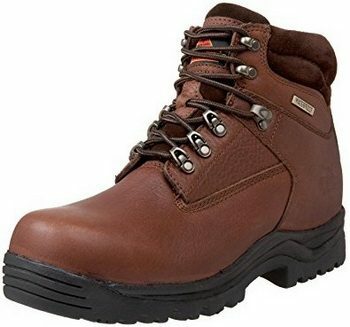 These boots because they fit well for wider feet, however, users did have a hard time finding these boots in store, and could only find them online. Those who have purchased these boots say that they do need to be broken in well before you use them on a hike. 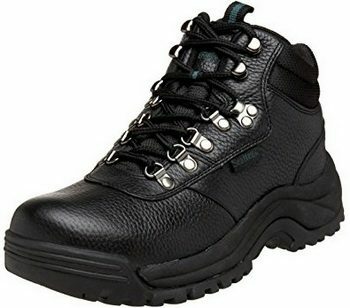 Overall, they are comfortable boots that have a high top, which helps when hiking. Related: While hiking, you will need a comfortable backpack. The OnePack 50L Backpack is under $50 and is waterproof. It has many straps and zips so you can store your items, and it fits comfortably. Specific features: Rubber sole, thinsulate lining for warmth, waterproof, shaft is 4.5 inches from the arch, compression molded EVA midsole for cushioning. 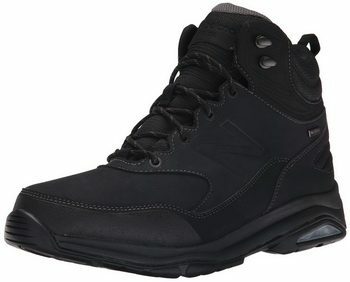 Description: The New Balance MW1400 Boots is an ideal solution for hikers and runners with wide feet. The footwear was made to be durable, waterproof and breathable to help athletes compete in the outdoors confidently. It further comes equipped with the compression-molded EVA midsole for cushioning in order to enhance breathability. The leather is durable and waterproof. But some customers have complained the fading water resistance quality after some months of use. We attribute that to the deterioration of the coating. To prevent that, we reckon the restoration of water resistant coating. 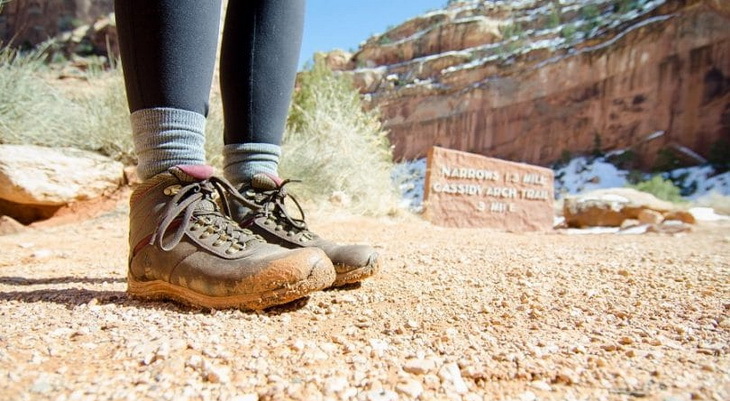 These trail boots come in three stylish colors: gray, black and brown. While not meant for wintery, or icy, conditions, these boots do get the job done. Users state that they are easy to lace and include a roller bar support. They are comfortable after a short period of breaking them in, and can be worn all day long without discomfort. Related: If you are out at night, you may consider getting a headlamp. The LE 3200001 Headlamp is great for camping, hiking, or night time exercise. It comes with batteries and has 4 modes of light to choose from. 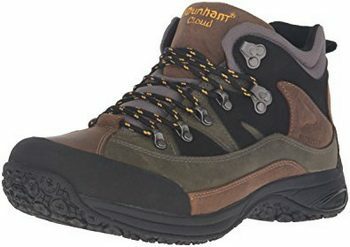 Description: The Dunham MCR6630G Cloud Boot is wide enough to accommodate your wide feet. It comes with an aggressive and excellent traction as well as a durable leather. If hiking or biking in damp conditions, the footwear will help repel the absorption of moisture so as to keep you warm and dry at all the times. Also notable is its ROLLBAR with medial and lateral TPU for stride aligning on any typical terrain traversed. The TRU-TRAK multi-directional lug on the outsole helps provide more traction in any direction you are headed. Meanwhile the tongue helps keep away the debris and provide added warmth. With these hiking boots, you have three color choices; Gray, Slate Black and Brown. These boots are made specifically for comfort and to support your feet throughout a day on the trail. The cushioning provides extra comfort that you will need. Users like the comfort, as well as the waterproof feature. Not only that, but they can stand the test of time. Those who have these boots state that after years of rough use, the boots are still holding up and ready for use. Related: If you are hiking in the winter, the Oldelf Tactical Sports Mask will keep you warm. It goes over your head to keep heat in and has a cover for your mouth, along with drawstrings. It’s under $10 and comes in an Army Green color. Specific features: Seamless and padded lining, made of leather, elastic lace closure with Velcro strap, gel insert to stay active, finest quality. Description: The Dr. 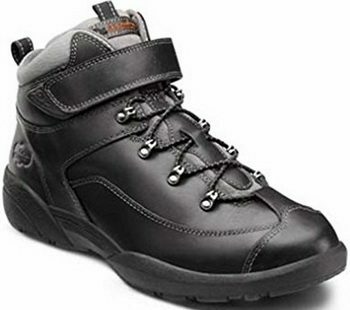 Comfort Ranger 9400 Boot has the finest quality for both outdoor and indoor adventures. It provides a proper fit despite being a no-tie elastic lace. 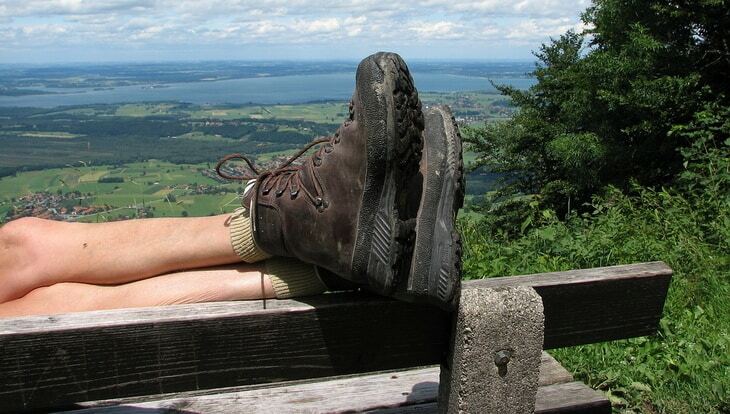 All that this hiking boots have is the best comfort for maximum stay in the wilderness adventures. The padded lining provides breathability to these hiking boots. Other customers are praising these hiking boots for their comfortability to diabetic patients. They cause no pain, blisters or soreness when you fit in the right size. The leather design will also help you evade the penetration of water during rainfall. You can find these hiking boots in shiny, leathery colors of Chestnut brown and regular Black. While these boots are a little more expensive than others, you can see how the extra price is worth the comfort, especially when it comes to diabetic patients. 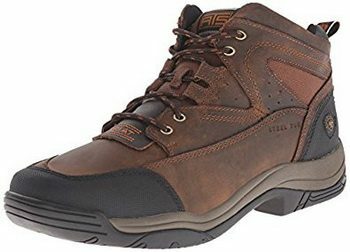 Overall, users agree that these boots offer not only the comfort needed, but the support to make it through the day while you are on the trail! Related: When you polish these leather boots, you will need a little brush. The Kiwi 191-003 Polish Applicator is made of all horse hair and has a wood handle. It costs around $6 and will not scratch your boots. Description: The Columbia Newton Ridge Boot has its mesh, suede and leather PU coated to repel water drops. With this polyurethane coating, you can feel confident of wearing these hiking boots in snowy conditions or downpours. But note that the PU coating needs to be cared for on a constant basis to revive its strength. To add to that, the boots come with a waterproof seam-sealed construction to reinforce an absolute resistance to water. The midsole provides cushioning and breathability to your wide feet. And the Omni-Grip feature helps with an advanced and rugged traction whenever trekking on slippery terrains. The shank under the arch offers the best support and stability to the footwear. With these features, your feet will be flexible and feel comfortable when hiking in any location no matter how inclement it could be. 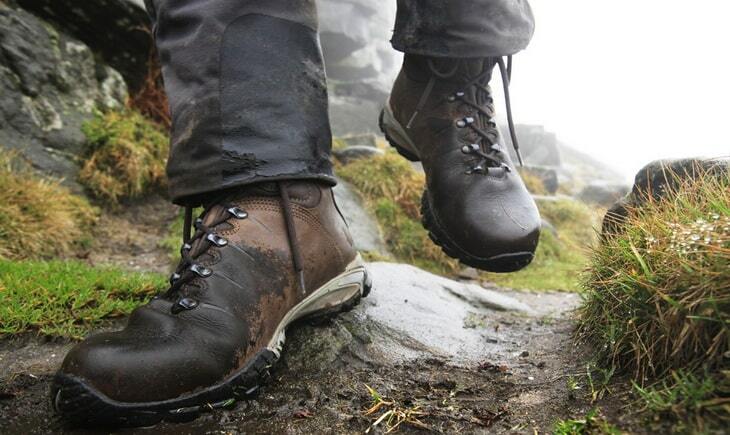 Overall, users like these boots for the waterproof feature, the cost effectiveness and the easy lace system. You can find these in the color choices of Cordovan, which is a dark brown, and in Black. Related: Be sure to have a great set of hiking socks before you go out. The MIRMARU INNMPJY Crew Socks is a 5 pack that will last you several days during a long hiking trek. Under $30, these socks come in several colors and are made of cotton, polyester and spandex. Description: Lined up with Gore-Tex, the world’s leading synthetic insulator, the Zamberlan 1006 Vioz GTX Boots assure you an excellent waterproof property and breathability. With these qualities, stands out as one of the great and indispensable hiking boots for wide feet with which the inclement climatic conditions can be overcome. The boots’ leather shell offers durability for seasons to last while having a pair. The Microtex moisture-resistant nylon collar enhances comfortability by resisting excessive moisture accumulation. And the company’s patented technology of Flex System helps your ankles to bend safely while support is being maintained. Thanks to an Italian native boots manufacturing company for providing this competitive outdoor footwear. While these boots are expensive to say the least, they do offer comfort and great quality leather, users say. They do only come in two colors of dark brown called Waxed Chestnut and Chestnut. Users also say that the boots have good tread on them for those times when the terrain is rocky. Related: While hiking, you may find having trekking poles will help you to remain sturdy and stable. The BAFX Trekking Poles are a pair of poles that are anti-shock, lightweight and made of aluminum. Description: This pair of hiking boots is deemed the best footwear for diabetic patients. So diabetic patients can enjoy executing a variety of outdoor activities wearing the Propet Cliff Walker Boots. The pair is equipped with a long shaft of 5 inches to provide an amble support to your feet. The mesh lining improves breathability of your footwear. We know that too much may be detrimental to diabetic patients. Fortunately, this pair has been designed to reduce that. Meanwhile, the leather design is attributed to the best waterproof. For a proper fit, the hook and loop lace system play a significant role. The width of these hiking boots was reported to be too wide for other customers. The remedy to that is to fit the thick padded insoles to compensate for that wide width. But obviously these were designed for the wide foot outdoor enthusiasts. The rubberized outsole is flexible and features a self-leaning design. It helps you hike safely in a variety of terrains. Related: If you find that you need more of a cushion, insoles can help. The Sof Sole R7OR5C Insoles cost around $20 and have a nylon plate in the arch, and is great at absorbing shock. Description: The Ariat XKR68 Terrain Boot gives all the comfort you need with a full grain leather that is durable. It also features a wide square toe profile for your wide feet and toes to move freely. And with the moisture resistant lining, odor-causing microorganisms are being reduced while at the same time providing an excellent breathability. The trademark of Duratread outsole provides maximum wear and abrasion resistance as well as the best traction. Looking at the insole, it has a gel cushioned moisture-resistant foot bed and a low-friction surface. The padded top collar and the shock-absorbing EVA midsole brings you the comfort you need. Some users state that you may want to order a size down, as they can run big. They also say the laces are easy to put on and really do help with muscle fatigue. They also absorb shock very well and are low friction boots that fit comfortably for most of the people who purchased this boot. Related: Be sure to protect your head and face when hiking. Wearing a sun hat can help. The Columbia Bora Bora Booney II Sun Hats are under $30 and made of nylon. It also wicks away moisture and has UPF 50 sun protection. With these reviewed top 10 hiking boots for wide feet, you’re guaranteed the best pair that will survive a variety of terrains and temperatures. 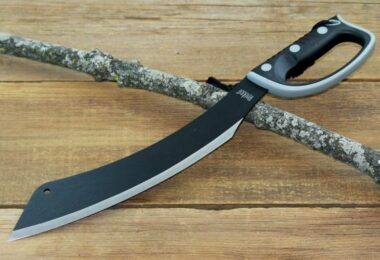 The reviews have emphasized the features that are paramount for all outdoor activities. Now, if you found our article to be informative and useful, and you think that your friends should read it as well, feel free to share it on social media. Also, if you think that we missed mentioning something important, let us know by leaving a comment in the comments section, where, those who own a pair of the models we reviewed, can also share their experiences with our readers. 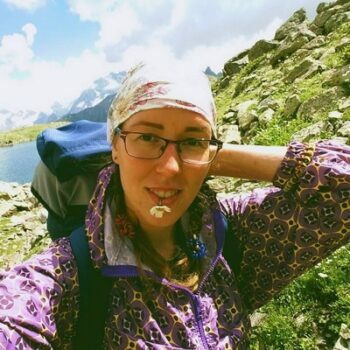 Best Hiking Hat: Love Them or Leave Them?